At Printers Row Dental Studio, you don’t need insurance to get the dental care you need at a price you can afford! 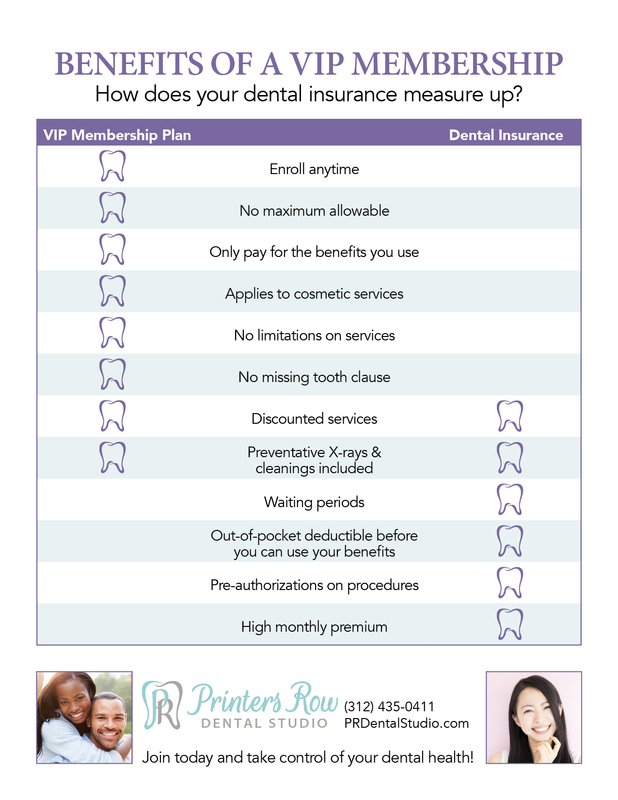 Our VIP membership programs are designed to give you access to the dental care you truly need without needing insurance. You can upgrade your plan to a periodontal care or a cosmetic plan at any time! If ineligible for periodontal treatment, you will be credited the cost of the periodontal treatment and charged only for our general dental care plan. When you join our Printers Row Dental Studio membership plan, you aren’t limited by waiting periods or limitations on treatments. We understand that not everyone has insurance, and we want you to have the smile you deserve no matter what. For as low as $365 per year, you can start saving on the dental care you truly need! To sign up for our Membership Plan and start saving today, come see us! If you want to learn more about how the VIP Membership Plans can help you get one step closer to the smile of your dreams, call our office at (312) 435-0411 to schedule your appointment. Your savings is waiting! For a one-time annual fee, you can take back control of your dental health. However it doesn’t stop at general dental care. We also offer a VIP Cosmetic Dental Care plan! Dr. Ema is committed to giving back to her community and she is committed to her patients. Her VIP membership programs are an extension of her commitment to you.